Why Use Perforated Metal Façades? Why do we use perforated cladding? A facade or rainscreen system is an exterior wall detail where the siding (wall cladding) stands off from the moisture-resistant surface of an air barrier applied to the sheathing (sheeting), creating a capillary break and to allow drainage and evaporation. Until recently this type of building support system has typically remained very basic and with little design-led purpose. Metalline has led the evolution in perforated metal facades which can create a far greater aesthetic whilst still providing the benefits of traditional cladding systems. 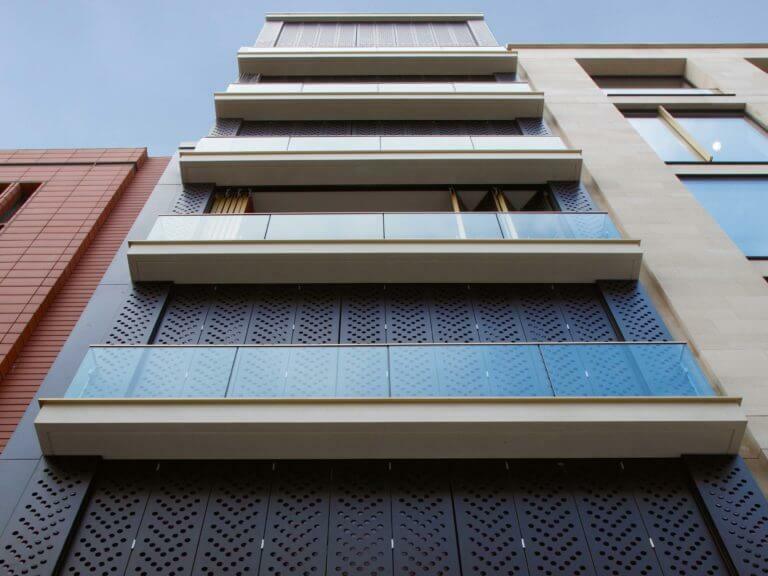 Traditionally, perforated metal facades are manufactured in a range of different materials and finishes. One of these finishes is perforated aluminium. Perforated patterns help create a striking building whilst maintaining a sound structure. Perforated metal facades are an effective way to enliven the building design of what would otherwise be a simple cubic structure. With a range of designs available from uniform circular perforations to honeycomb-patterned latticework, perforated metal cladding has the ability to add depth, texture and further intrigue to a facade. At Metalline, we are at the forefront of the rainscreen cladding industry, by producing aluminium perforated panels and high-grade sheet metal panels, fins and pressings. We can work to bespoke perforated facade specifications to suit you as the client and your architectural needs. With our state-of-the-art machinery, we have the ability to assist clients in their bespoke specifications to provide stunning designs that are also practical. This enables our clients to construct the most striking and architecturally beautiful buildings with the help of our highly skilled workforce.